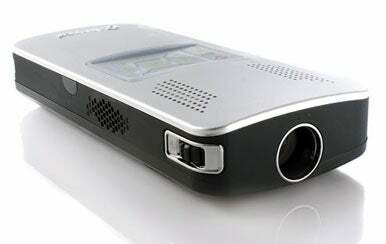 Aiptek's versatile PocketCinema V10 Plus pico projector has features that its rivals lack, along with some limitations. Its best attribute is its ability to display presentations, photos, and videos without being attached to an external device. With a brightness rating of 10 lumens, the V10 Plus can put on a show for a small audience in a room with minimal ambient light. Its small metal tripod and useful remote control simplify setting it up and controlling your presentation from anywhere in the room. Weighing 5.6 ounces (with battery), the 0.9-by-2.2-by-4.9-inch V10 Plus is not much bigger than a thick candy bar. It has a native VGA resolution of 640 by 480, dual 0.5-watt speakers, and a battery life of 90 minutes. The projector's strong suit, however, is its extra features: A card slot reads 32GB SDHC memory cards, and a media player has 4GB of internal memory for storing presentations, photos, movies, and video clips. No other pico projector we've tested can capture video (up to 1.7GB per clip) via its A/V input port from an external source such as a camcorder or DVD player. Unfortunately, the lifetime of the V10 Plus's LED light is just 10,000 hours, half that of 20,000-hour models. Its LCoS (liquid crystal on silicon) technology uses 3M's older, first-generation MM100 projection engine, rather than its newer MM200 version, which delivers higher-quality images and consumes less power. And the V10 Plus lacks a VGA input, relying instead on an included S-Video cable to connect to computers that have an S-Video out capability (which is not as common as VGA). In low ambient light at a distance of 3 feet from the screen, the V10 Plus displayed a viewable 23-inch-diagonal image. In a darkened room, it displayed a 48-inch-diagonal image at 6 feet from the screen. Larger screen sizes were possible but looked less bright. In our performance tests, the V10 Plus earned a rating of Good for overall image quality. Its text and graphics screens weren't impressive. The V10 Plus's text slides weren't quite sharp, and its color graphics looked pale. In our motion tests, the V10 Plus projected viewable podcasts from a fifth-generation iPod nano and YouTube videos from an iPhone 3GS reasonably well, but during fast action sequences of the Monsters vs. Aliens DVD, the video displayed some jerkiness that wasn't apparent with other pico models. The V10 Plus's sound was quite audible; still, we'd want to use a separate sound system for watching a feature film. The V10 Plus comes bundled with a USB cable for transferring files (photos, videos, and music) from a computer to the projector, and a composite (RCA-type) A/V cable for connecting it to any device that has video signal output. You'll need a third-party cable, however, to use it with an iPod or an iPhone. Alternatively, you can leave all the cables behind, and use the V10 Plus's built-in media player to project your presentations, photos, and videos. The projector also comes loaded with ArcSoft Media Converter 2.5 software for converting images, videos, and audio files to formats that the V10 Plus supports—but the software is Windows only. Aside from its lens adjustment wheel, all of the V10 Plus's controls (for turning it on/off, adjusting the volume, and accessing the on-screen display) are located on the unit's top; all are easy to use. The remote control is handy for operating the media player. With its built-in media player, video recorder, and memory card slot, the PocketCinema V10 Plus is a solid stand-alone projector, but its image quality trails that of the top performers.